Can you believe it’s 2019?? I think I need to lie down. Okay, now that we’ve come to terms with the insanely rapid passage of time, I would love to show you my design team project for January! 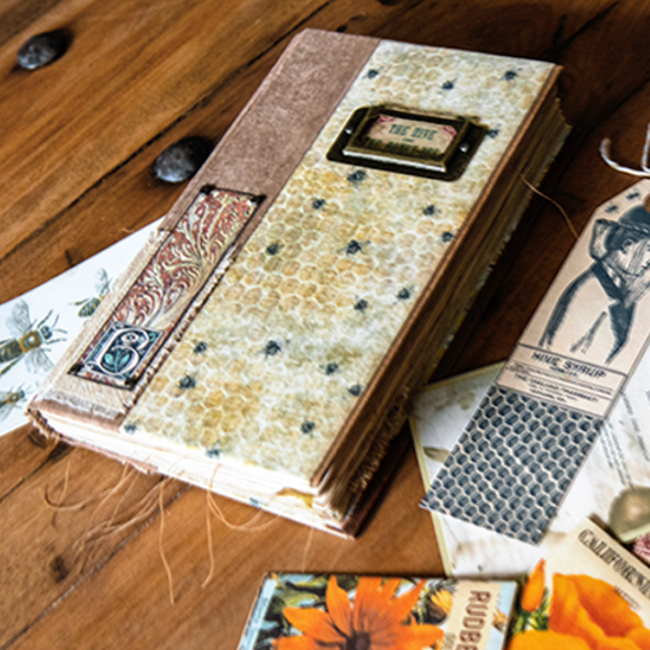 My inspiration for this journal is the humble, yet essential, honey bee. Einstein once said, “If the bee disappeared off the face of the Earth, man would only have four years left to live.” Well, that’s sobering! But maybe it’s something we should all keep in mind. 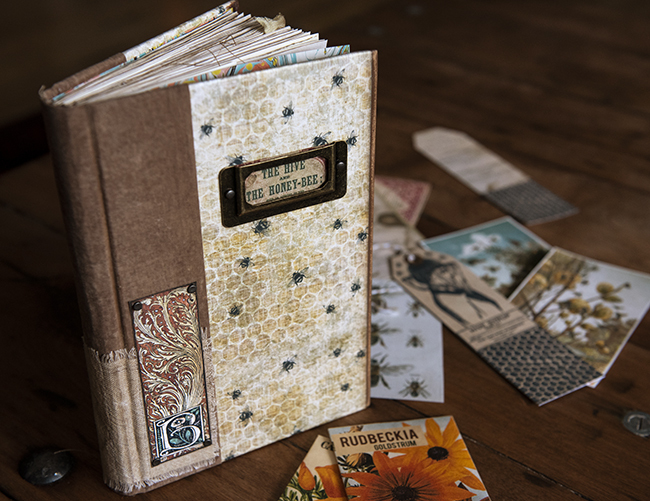 In light of how indispensable bees are, I created this book as an Ode to the Bee. On the cover, I’ve used a graphic I created for Spoonflower, but printed it onto a high-resolution paper. 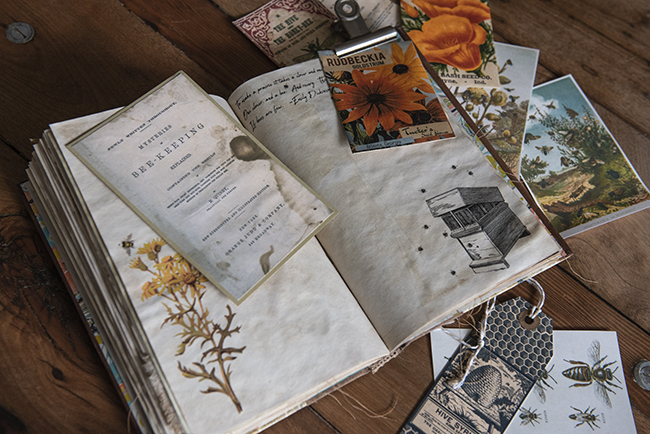 Then I covered the spine with a mocha brown, distressed textile, and a patch of aged, tattered muslin. 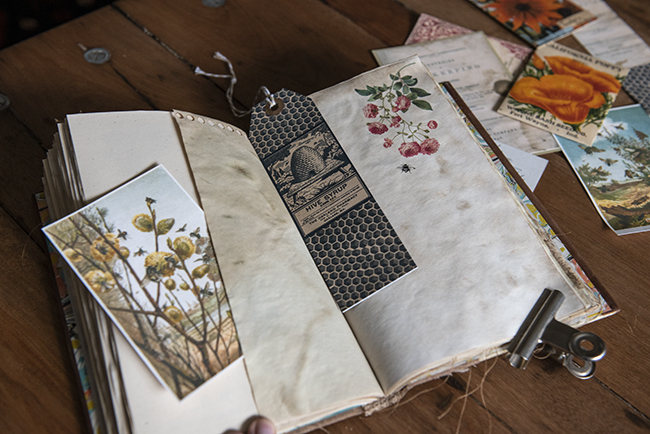 Along with this book comes an assortment of ephemera of the bee variety! At the Graphics Fairy Premium Membership site, I found a bundle called Beekeeping. It has 17 brushes (or clipart) for Photoshop/Photoshop Elements and I used most of these! It also has some projects already made up and ready to print. The bookmarks were absolute perfection! Because bees’ best friends are flowers, they also made an appearance in this book. I used colorful, floral clip art that was also found at the Membership site in a bundle called Roses and Bees. That bundle was helpful because not only did it have clip art, but also some black and white photoshop brushes. I loved the bee and the roses page art! A Nik the Booksmith journal would not be complete without some poetry, so of course I had to include some of my favorite quotes and verbage and sprinkle them throughout the pages. The California Poppy and Goldsturm Rudbeckia are among the favorites of my bees. 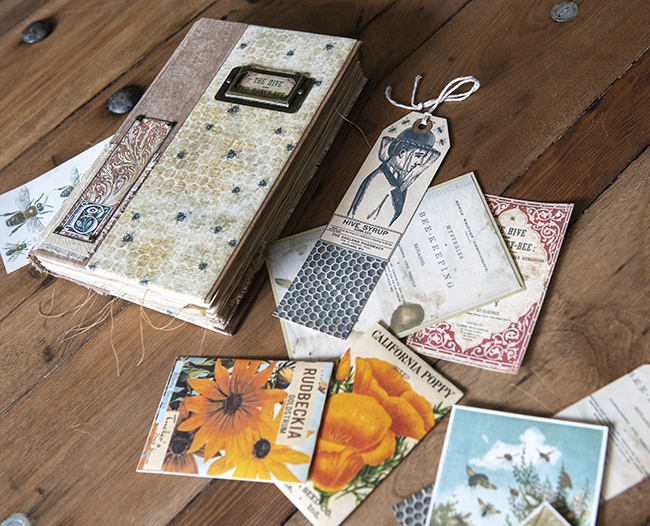 So as a special inclusion, I made up some antique-looking seed packets and filled them with seeds from my own garden. I think they add a personal touch to this journal! 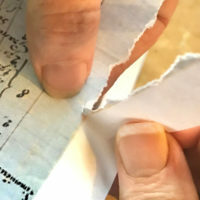 Thank you for taking the time to peek at my book. 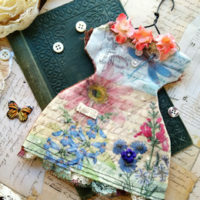 I hope you enjoyed my Graphics Fairy design team project for this month. If you did, I hope you plant some bee-loving wildflowers in your yard this Spring and join me in thanking our busy bees. They truly are the gentle, modest caretakers of pollination! 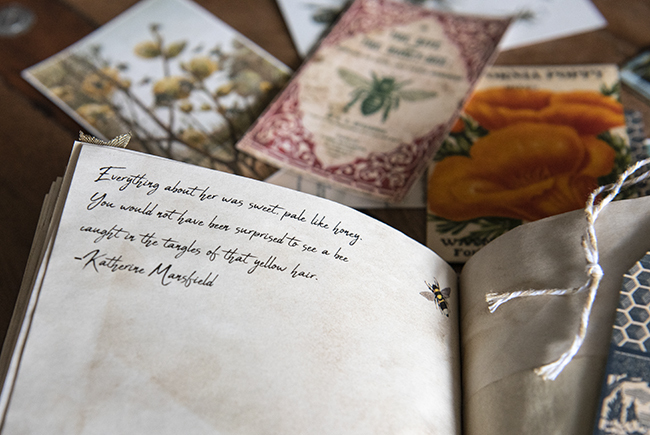 I love the garden and bee ephemera bundles that the Graphics Fairy offers! I used Beekeeping Bundle and Roses and Bees Bundle. I have a complete flip-through of his Poet’s French Junk Journal on my YouTube channel. 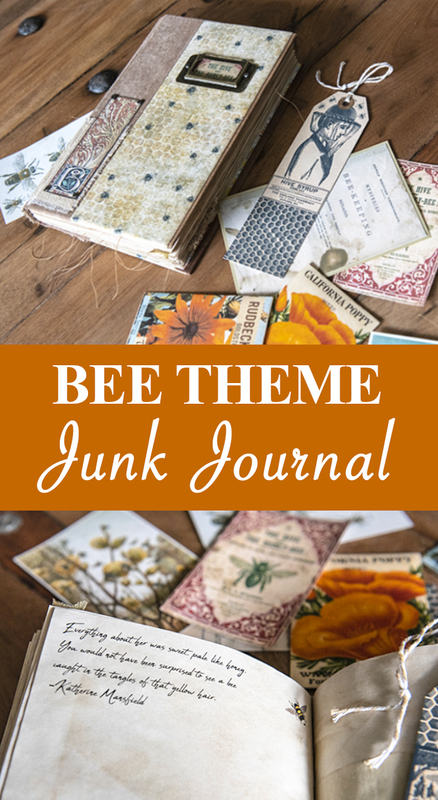 Thank you for taking a peek at my Bee Junk Journal project for The Graphics Fairy! 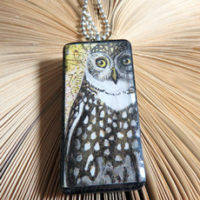 You can find my work on My YouTube Channel or in My Etsy Shop. See you next month. « 9 White Botanical Flower Images! hope you feel better soon. I really loved this one, Nik. Brava!! Thanks so much Jan, Happy New Year!